Evil kids are everywhere in horror—but there’s also no shortage of evil parents. A list of every single awful mom and dad from every single horror movie would be as thick as a full set of Friday the 13th VHS tapes. But while we eagerly await the scary parental unit in this week’s Us, we’re tallying up our favorites from the worst of the worst. “His mother was a clinging, demanding woman, and for years the two of them lived as if there was no one else in the world,” explains the psychiatrist who’s just examined a very-far-gone Norman Bates (Anthony Perkins) at the end of Psycho. Though Norma doesn’t actually appear in the movie—except as a skeletal corpse, of course—she’s one of its main characters, brought back from the dead (so to speak) by her deeply troubled son, with a controlling influence that reaches from beyond the grave and stokes Norman’s murderous impulses. Would he have been a killer even if he’d had a kinder upbringing? There’s no way to know for sure...though while we all go a little mad sometimes, most of us don’t stab strangers in the shower. Hair of the dog that bit me, Lloyd. He wasn’t going to win Father of the Year even before he brought his family to the Overlook Hotel—there’s mention of a drinking problem, and an “accidental” grab of son Danny’s arm that put the kid in a cast. But when we first meet Jack (Jack Nicholson), he’s at least trying to turn things around, figuring he’ll use the peace and quiet of the snowbound location to work on his writing. Unfortunately, that plan quickly evaporates, and Jack’s vulnerable mind falls under the influence of the hotel’s malevolent spirits. Wife Wendy isn’t spared from Jack’s rage, but the psychically gifted Danny gets the brunt of it, and is forced to confront supernatural horrors (“Come and play with us, Danny!”) that are nearly as scary as having to run and hide in a blizzard from his own ax-wielding father. The Bible, regrettably, doesn’t have a “how to talk to your daughter about puberty” section. A religious zealot who probably would’ve been an oppressive parent no matter the circumstances, Carrie’s mom (Piper Laurie)—in the second Stephen King adaptation to make this list—is extremely ill-equipped to deal with her daughter’s remarkable telekinetic powers. Hell, she doesn’t even bother to explain menstruation to the naive teen and treats Carrie’s humiliating first period as a reason for punishment. Though Margaret is pretty fond of doling out punishments for any and all reasons, as well as ripping into her daughter’s self-esteem at every opportunity. In the end, her cruelty pushes Carrie—who’s already a mass-murderer at this point—to matricide, though the impact of what she’s done is so devastating and destructive that Carrie doesn’t survive it either. 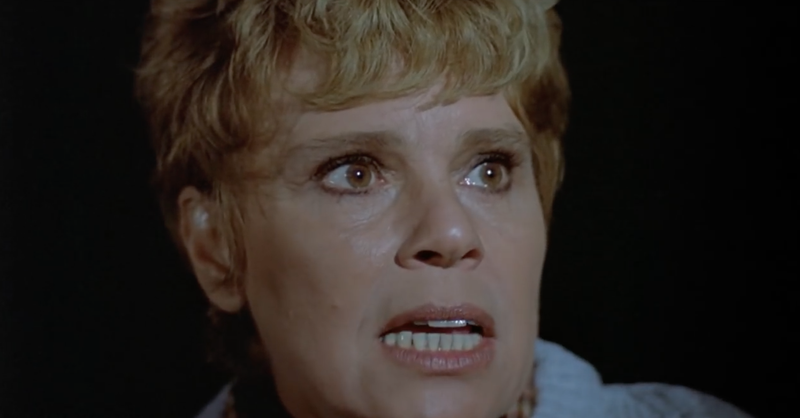 One could argue that Pamela (Betsy Palmer) was actually a good mother while her precious li’l Jason was alive—just a tad overprotective and excessively doting, that’s all. Her violent ways surfaced after the boy drowned, a tragedy she blamed on the negligent (and horny) counselors of Camp Crystal Lake, and for which she took bloody revenge after biding her time and, presumably, building up a stockpile of very large knives. Though Jason is presumed to be dead in the first Friday the 13th, he pops up (literally) as a waterlogged corpse-boy in the “gotcha!” ending—and by the sequel, he’d become a full-grown killer striding through the woods, slashing teens and making his mother proud. Too bad Pamela didn’t live to see Jason take up her quest for vengeance, though considering her son’s weird supernatural energy, there’s always a chance she’ll reappear someday if they ever start making Friday the 13th sequels again. George (James Brolin) was an OK dude when the Lutz family, which also included his wife and her three kids from a previous marriage, moved into their Long Island dream house. Sure, DeFeos, the home’s previous owners, had all been horrifically shot to death in their beds by the family’s oldest son, who claimed he’d heard demonic voices telling him to slaughter everybody, but the Lutzes weren’t easily spooked—and besides, they’d never be able to afford such a spacious house otherwise. The DeFeo tragedy is real (it’s a toss-up on those demonic voices), but the Lutz’s haunted-house ordeal, once framed as a true story, is now better categorized as fiction. And it’s a good thing because George ends up going down the same path as The Shining’s Jack Torrance, spellbound by bad vibes and acting very much like a guy who’s plotting to obliterate his family. Fortunately, the Lutzes manage to escape before any of the kids suffer permanent physical damage. What’s worse than a stepdad who becomes dangerously possessed, almost to the point of killing someone? How about a stepdad who’s got an actual mass slaughter hidden in his past? Terry O’Quinn (who later starred on Lost) plays the title character, a habitual practitioner of murder and identity theft who makes the mistake of marrying a woman whose teenage daughter soon catches on to his deception. Released in 1987, The Stepfather is more or less part of the era’s slasher-movie trend, but it also preys on more grounded fears about all the things that could go wrong when a new parental figure suddenly becomes part of an established family. Tops on that list, amply demonstrated by O’Quinn’s chilling performance, is the realization that he’s a homicidal maniac, and you’re his next target. Life in colonial New England was rough for everyone, but things are especially harsh for the family in The Witch, who are banished from the main settlement after clashing with religious leaders and forced to live on an isolated homestead adjacent to a wild, spooky forest. After their infant son is snatched up by their sinister neighbor and their spiral into tragic chaos begins, William (Ralph Ineson) and Katherine (Kate Dickie) turn on their oldest daughter, plotting to sell her off as a domestic worker to some random family and generally treating her like dirt, accusing her of witchcraft, and finally trying to kill her. Hail Satan for giving that poor girl—who ends up being the sole survivor of her family’s sad ordeal, unless those bratty twins are still out there somewhere—the most unconventional of happy endings. Wes Craven’s 1991 horror comedy stars Everett McGill and Wendy Robie—who famously also played a very different kind of dysfunctional couple on Twin Peaks—as terrible landlords who are also horribly cruel parents. Except they’re not really parents, they’re an inbred brother-and-sister duo who’ve been adding kidnapped kids to their booby-trapped basement prison/torture chamber/cannibal proving ground for years. The house hold includes an obedient daughter who gets to live in the main part of the house, as well as a disobedient boy (who’s had his tongue chopped off) who lives in the walls. As terrifying as this all appears at first, everyone in the movie—including the heroic neighborhood kid who discovers the house’s atrocious secret by accident—ends up banding together to give Mommy and Daddy their just desserts, and there’s a campy tone running throughout to remind you that despite Craven’s prior filmography, The People Under the Stairs aims to lean more into satire than nightmare. It’s another pitch-black comedy with cannibal themes, but Bob Balaban’s oddity is a bit of a different animal than The People Under the Stairs. It’s about a boy growing up in 1950s suburbia, with parents (Randy Quaid and Mary Beth Hurt) hiding a secret that’s slightly out of step with typical Cold War-era concerns. The kid’s been having super-disturbing dreams, and when his concerned school guidance counselor starts poking around, his plastic-perfect home life starts to get, uh, bloody complicated, as mom and dad decide it’s high time he starts carrying on the family culinary tradition. When he resists, it doesn’t go over well, especially from Dad’s point of view. Parents, which slurps from the goblets of both David Lynch and John Waters and is probably best avoided by queasy vegans, was released in 1989 and was met with befuddlement—but inevitably, it’s since found new life as a cult favorite. You can’t blame a desperately blocked writer for seeking out an unsolved murder as his next research subject/book inspiration. You can’t even blame that writer for moving into the very house where a hideous crime involving the death of an entire family—all hung from a tree outside, aside from one little girl who has yet to be found—recently transpired. You can, however, blame that guy (played by Ethan Hawke) for not letting his wife know about the house’s history, especially when he finds out that the murders were associated with an ancient demon who preys on children...and his kids start acting quite unlike themselves. The last bad decision that Oswalt makes—you know, the one that seals his family’s ultimate fate—is something he doesn’t realize is a huge mistake until it’s too late. But he should have been more open with his family before he dragged them along on his true-crime real-estate joy ride.